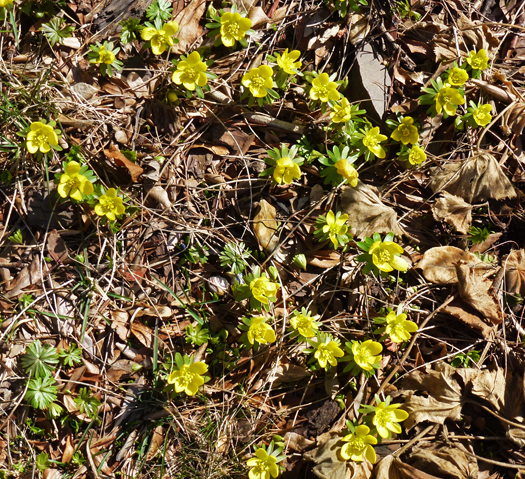 It has been colder than normal so far this spring but the sun is strong and it has heated the ground up enough to bring out the Winter Aconite. Such a cheerful sight! They open up when the sun hits them and stay closed if it is cloudy. ...and mine are covered with snow this morning. Yay!! It's good to see that spring is making an entrance in the northern climes. Very pretty. I wonder if we have those down here. Glad that things are warming up for you. We still had a bit of snow falling this morning. Ah signs of spring! Love yellow flowers -- they are like little sunshine spots on earth. Things are growing pretty good in the big city. Don't see anything happening in my tiny city. Oh my you are so lucky! I still can't even see where my tulips and other plants are and they say another snow storm this weekend! Yes, at last! We don't have any, although a few crocus are CLOSE!! !